The Birmingham Symphony Hall was opened in 1991 by the NEC (National Exhibition Center). In 2001 the Hall was completed with the installation of the 6000-pipe Symphony Organ. It rose to immediate public and critical acclaim and was instantly acknowledged as one of the finest concert halls in the world. The Birmingham Symphony Hall is a model of modern concert hall design and the acoustics are the benchmark by which all new concert halls are measured. The hall is famous for its excellent acoustics - there is a reverberation chamber, a highly visual acoustic canopy and acoustic curtains. The Hall's diverse program of events includes world-class music of different genres from classical to jazz, folk, rock and pop and also comedy. 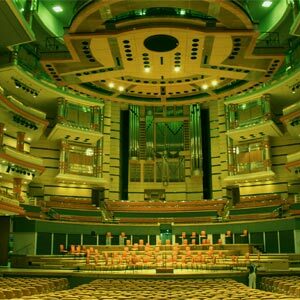 The Symphony Hall is home to the City of Birmingham Symphony Orchestra and also plays host to visiting orchestras, celebrity recitals, non-classical acts and top comedians. The Hall also plays an important role in the life of Birmingham's people and is regularly used for community events, graduation ceremonies, and corporate conferences. Over 350,000 people attend nearly 270 events at Symphony Hall every year. The Symphony Hall has charitable status and its Community department reaches 20,000 people each year in projects for schools, community groups and families. The Symphony Hall of Birmingham is situated within the International Convention Center (ICC) and is easily accessible and well equipped for people with disabilities. An induction loop system is used in selected halls at the ICC and these can be linked to visitors' hearing aids.